The Infinity Studio is a place where you can enjoy some quiet time to let go of your agenda and get to know yourself, body, mind, and spirit. It is a place where you can explore the many benefits of a yoga practice, including greater strength, improved balance, more flexibility, and a calm mind. We are here to support you on the path to limitless health through yoga, reiki, meditation, and wellness products. I was introduced to yoga over 19 years ago, and from the very first class I was hooked! I loved how much strength it took and found the breathing and relaxation techniques help to calm my over active mind. I began my journey to become a yoga teacher when I moved to Monroe, WI in 2005. 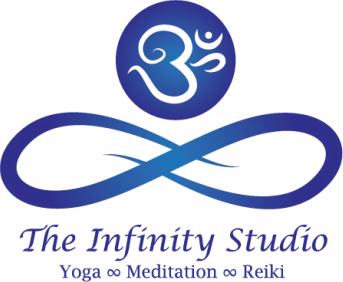 Today, I am a registered yoga teacher, with over 12 years of teaching experience, and I have been operating The Infinity Studio since 2008. I graduated from the 500-hour Yoga Therapy Teacher Training Program through Alignment Yoga with Scott Anderson in 2013, and continue to take training classes and workshops to keep my teaching fresh. My training is based in Hatha yoga, with influences from various yoga styles and healing modalities. The classes I teach focus on proper alignment, core strengthening, balance, breathing practices, and guided meditation. Every class is unique offering a mix of strength and flow, while giving students individual attention and customized instruction based on their skill level. I strive to make every class unique, and hope to inspire everyone who walks through the door to take what they learn on the mat, and incorporate it into their daily lives. My passion for health and wellness extends beyond the yoga mat to help people connect with natural products and alternative healing. I am a Reiki Master Practitioner and offer sessions by appointment. I have been partnered with Shaklee corporation for over 25 years and offer Free 30 minute Health Consultations and access to high quality nutritional supplements and wellness products offered through the studio. You can visit my website pws.shaklee.com/ubhealthy or click on Shaklee in the services tab to learn more. I started my yoga practice in 2008 when I was introduced to my first class. At the time I was craving balance in my life on multiple levels: physical, mental, and spiritual. My new-found yoga practice taught me about the beauty of the human body and helped me to better understand self-love and self-acceptance. It also showed me the joy of living in the moment and slowing down to better connect with my spiritual side. I became a registered yoga teacher (RYT 200) through Alignment Yoga in 2016. My classes will invite you to embrace the present moment without expectations or self judgement to help you reconnect your body, mind and spirit. Together we will experience the transformational power yoga can have on your life. I started doing yoga a little over 4 years ago, to possibly help with the “stickiness” in my body due to severe injuries I sustained in a car accident I was in at the age of 16. From my first class at The Infinity Studio, I was hooked! I attended classes 2 times a week, and over the course of about 2 months, my “stickiness” was gone! I had more freedom of movement in my body, and a more calm and clear mind. Completing the 200-hour Alignment Yoga Teacher Training has given me the confidence and knowledge to become a yoga teacher and help others work through any “stickiness” … body or mind. Looking forward to meeting you at The Infinity Studio. ﻿I've been practicing Yoga on and off for nearly 50 years. When I became a dancer and then a dance teacher, I often incorporated yoga movements in my classes. After I began practicing regularly at The Infinity Studio, I found myself wanting more information about anatomy, as well as the history and philosophy of yoga. My year in the 200-hour teacher training at Alignment Yoga was challenging, enlightening, and very worthwhile. I practice for the physical benefits, but also for the mental benefits of mindfulness and calm. Yoga gives me more clarity and less reactivity to the stresses of life. I enjoy teaching yoga because I believe in its benefits, and it's wonderful to hear from people that they've learned something new that is of value to them. ​I started my yoga journey full force in the summer of 2017 when I participated in a teacher wellness program called Breathe for Change. I did this to bring balance to my life and find techniques to use with my students and fellow staff members at school. I received my 200 yoga alliance certification and a wellness champion certificate. Yoga is so much more than just poses. It is about finding what is right for your mind, body and spirit and knowing what is best for you to find balance. My hope is to support others in their journey with wellness and finding balance through teaching and sharing my journey. I came to yoga about 6 years ago to regain my flexibility and balance lost naturally with age. I wasn't excited about it at first and then, I realized the joy of yoga! Not only did I feel better physically, but daily stresses didn't seem to affect me the same. I was calmer in mind and spirit as well as body and soul. Completing the 200 hour teacher training with Alignment Yoga has given me the confidence to share the benefits of yoga with others of all abilities, size and shape! I am excited to continue my yoga journey and share it with others. Looking forward to meeting you on the mat at The Infinity Studio. I am relatively new to yoga, but I knew after my first class in 2015 that there was something magical about the way yoga made me feel. The thing was, it actually made me ​feel​ my connection with my body; I was shocked to realize I had been missing that connection for a very long time. I quickly realized that yoga was helping my stress, my chronic back pain, my strength & flexibility and my overall feeling of happiness in the world. I enrolled in teacher training to learn yoga poses, but received so much more… I learned that there is nothing magical at all about yoga, it is a very successful philosophy of action that science continues to back up at the physical and psychological levels. I have taken additional training in yoga for aging populations and have a deep interest in yoga for the recovery community. Yoga is unique to each of us, it helps us to tap into our strengths and our unique gifts, it helps us to age with less pain and more grace. It is a practice I look forward to sharing with you!